Does your metal meet DOT standards? 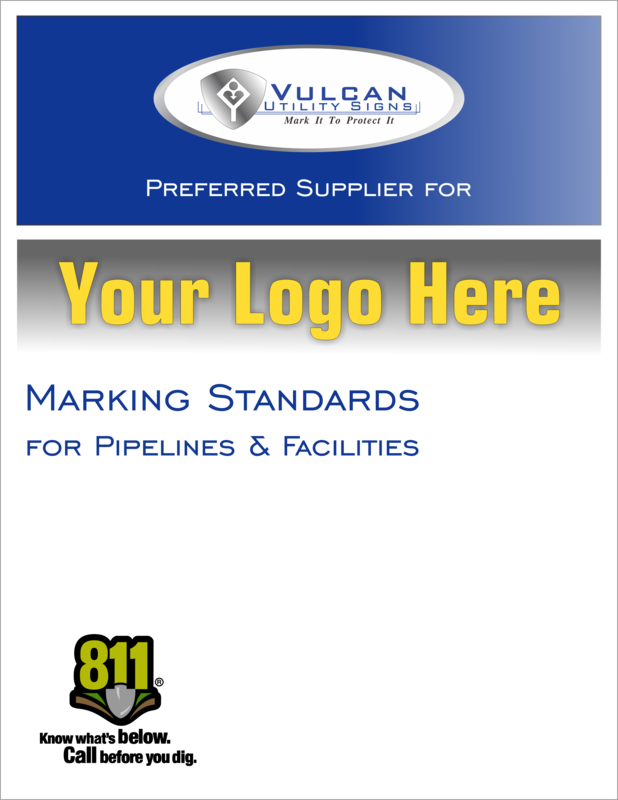 Vulcan specializes in the manufacture and fabrication of 5052-H38. Its long-standing reputation as the industry standard speaks for itself. Does your sheeting meet the minimum retroreflectivity? Yes. Vulcan Signs is an exclusive 3M fabricator and all of our signage utilizes 3M sheeting, which meets the minimum retroreflectivity standard. Does Vulcan make custom signs? Yes! Fabricating signs for the transportation industry is where we have made our mark in the signage world since 1966, but over the years we have grown and expanded our product offerings to include endless possibilities for custom signage. The addition of our in-house laser cutter enables us to fabricate completely unique shapes. From our very own Vulcan Aluminum, we have lasered everything from monograms for door hangers, to intricate logos, giving a standard sign a layered or 3D effect. Our large format digital printer broadens our abilities to offer signage that includes full color, high-definition photography and graphics as well. The experienced graphics team at Vulcan has the knowledge and expertise to take a generic idea and fine tune the design, producing an end product that includes the right balance of graphics and verbiage for an effective message. 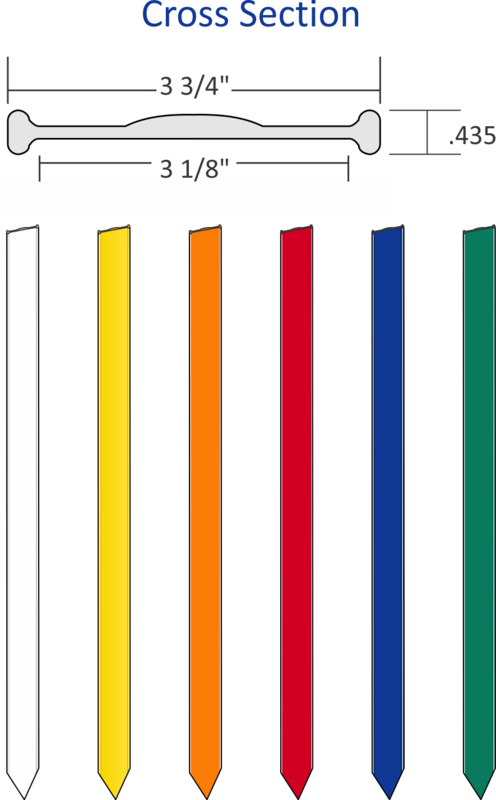 We also have the ability to color match any Pantone color using 3M translucent inks. Big changes are in the works for Vulcan Aluminum, also known by employees as Plant 1. Established in 1968, Plant 1 was the very first of Vulcan’s production facilities built in Foley, Alabama. Back in the day, Plant 1 was where all the magic happened, primarily because it was the only building that existed on campus. Before Vulcan grew to include five separate, but integrated manufacturing divisions, Plant 1 was truly the hub of all the action. 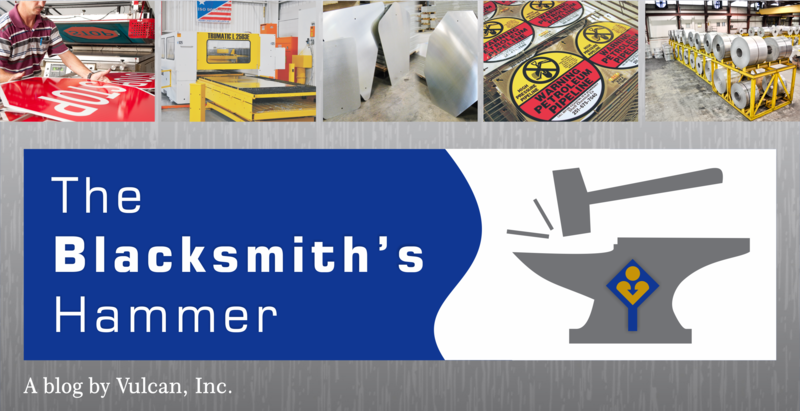 Not only were aluminum sign blanks produced in this facility, but finished signs were offered as well… all under one roof! Today, these two manufacturing processes have been separated; Plant 1 fabricates and treats the aluminum blanks and Plant 3 (Vulcan Signs), takes the blanks and screens messages onto them, creating the finished product. The separation of the two divisions has proven to be the right move. 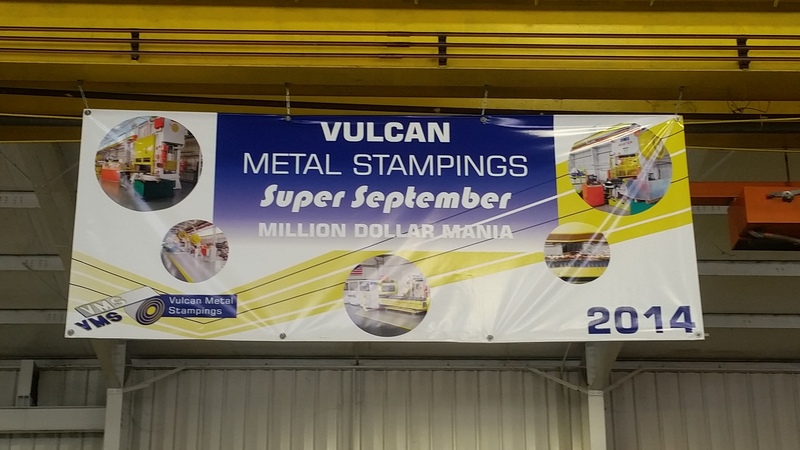 In fact, Vulcan Aluminum is the largest manufacturer of aluminum sign blanks and sheet in the United States, while Vulcan Signs has also grown to become a top player in the transportation and custom signage industries. The beginning of big changes! Throughout all of this growth and development, the original Plant 1 structure has fared extremely well. However after 47 years, it is time that Plant 1 received a little bit of a facelift. 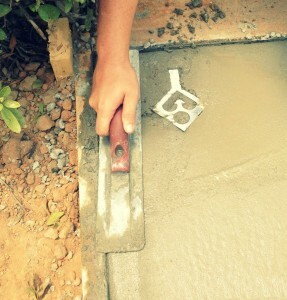 Physically, demolition and reconstruction of the original structure has already begun. The scope of work includes a design for a new conference room, as well as remodeling the existing break room and bathrooms. Each facility’s break room serves as the gathering space for plant-wide meetings and it has become a trend on campus to retrofit these spaces with big screen LED TVs, which are used to display training videos, as well as communicate safety and hazardous weather information. Luckily, no disruption of the production schedule will take place, so expect shipments to continue as usual. 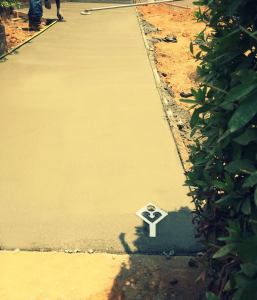 Stay tuned… the transformation will be complete in only a few short months and we will be sure to post updates on the progress along the way! 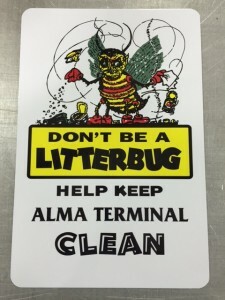 Here at Vulcan Utility Signs, screen printing has long been our bread and butter method for producing quality signage for the utility industry. However, as part of our effort to offer a diverse product line enriched by a multitude of manufacturing capabilities, we have expanded the ways we can produce signs and markers to better meet those needs. One example that is representative of our growth is our digital print capability. This versatile printing process gives us the ability to produce almost any type of sign our customers can dream up. 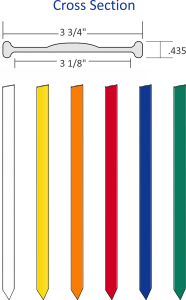 Whether it is a sign with a hundred different colors, a complex graphic or a high-resolution photograph, we have the capability of printing it. Have a celebration or special event coming up? We can design and fabricate eye-catching banners to celebrate achievements or promote events. Digital printing has also proven to be a more cost-effective method for small orders with multiple colors when compared to traditional screen printing. Take a look at the sign below. The intricate details of the “litterbug” can easily be digitally printed in the time it takes to get photos made at the local pharmacy. Operating a sign business inevitably means you are going to get unusual requests for signs. With the digital printer, we can handle most, if not all, of those requests that come our way. We hate to toot our own horn, but there is something extremely gratifying about working with a customer to provide a solution that truly makes a difference in the productivity and efficiency of their business. 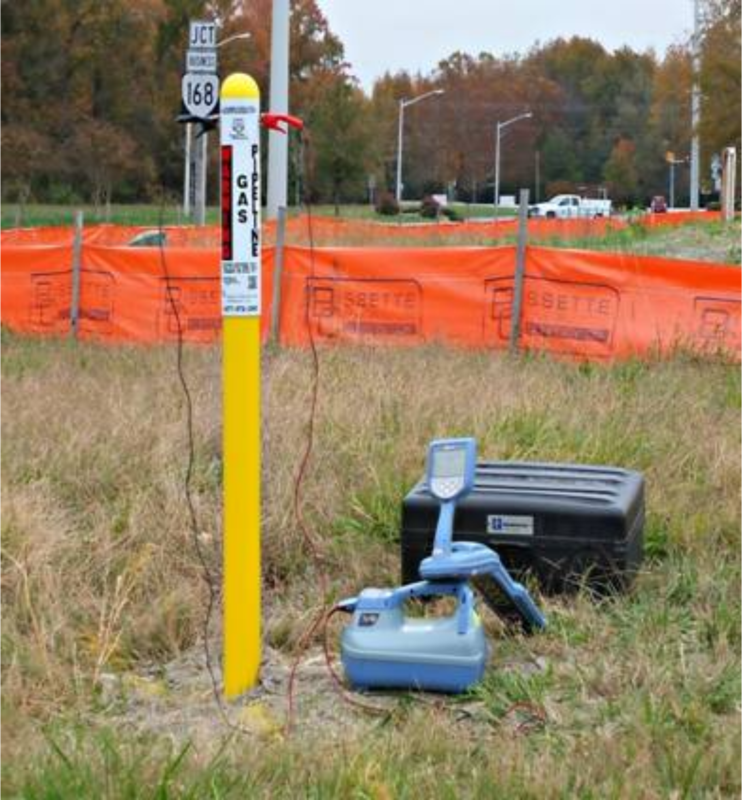 As the leading manufacturer of pipeline marking products in the industry today, we often promote the fact that we are a “Marking Solutions Provider.” What does that mean exactly? Well, we don’t just sell products that you see pictured in our catalog or on our website. When a customer comes to us with a specific marking issue they are having, that’s when we roll up our sleeves and put our thinking caps on. We assemble a team consisting of a variety of disciplines from engineering, to production, to customer service, all with the same goal in mind… develop a marking solution that will fit our customer’s needs. This was exactly the case when we received a call from Zackery Gravely, with Virginia Natural Gas. Once Zackery explained the issues he was experiencing, we were able to design and fabricate a custom Vulcan Bullet Marker that incorporated a locator. 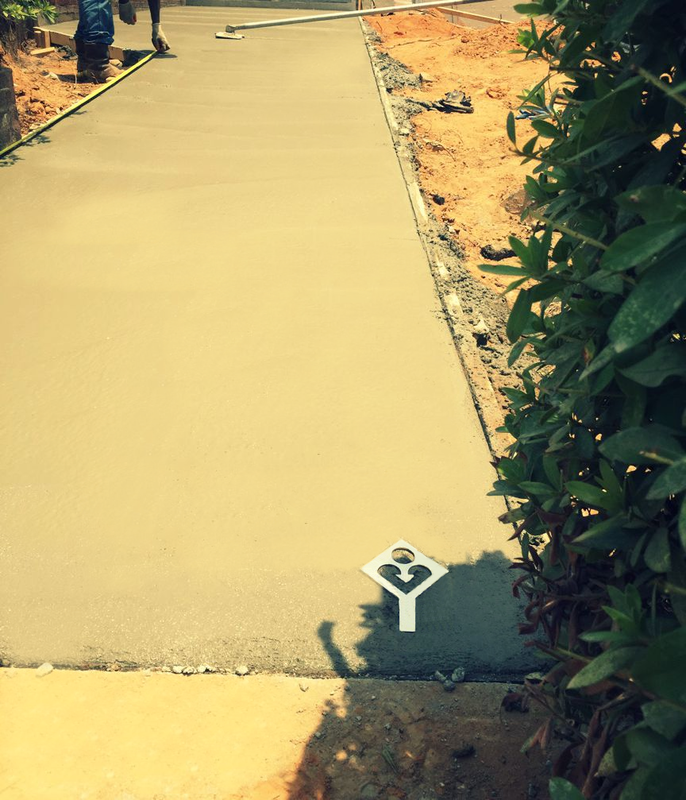 By the end of the project, Zackery got exactly what he was looking for and our team felt accomplished knowing they had worked through several challenges to meet the needs of a customer looking to us for a solution. 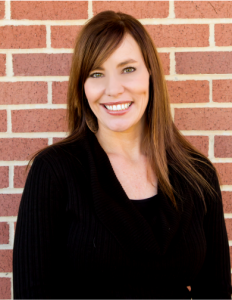 Stacy Holland, Sales Representative for Vulcan, worked closely with Zackary Gravely coordinating the project. 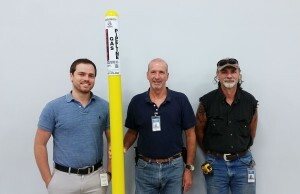 Left to Right: Boston Sherrier, Rocky Stewart and Mark Walker from Vulcan designed and developed a prototype marker to ensure its functionality, then shipped it to Zackary for testing. 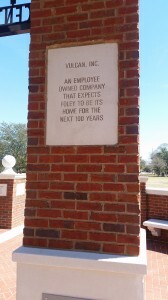 In 1984 Vulcan’s founder, Cater Lee, started a tradition that we are proud to say lives on today. Vulcan Scholarships, Inc. was founded in 1984 to provide financial aid to Foley and Robertsdale High School students who elected to pursue an engineering career. 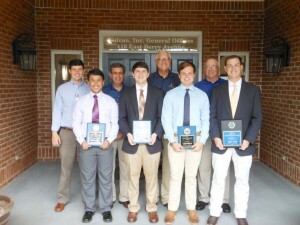 In 2001 Gulf Shores High School students became eligible for the scholarship awards. The scholarship awards seek to espouse Cater’s belief that… “No one makes it all alone, no one is successful without help from someone, somewhere along the line”. By providing financial support to engineering students it was his wish that during the course of their professional careers they might make a meaningful and lasting contribution to society. Since 1985, the Foundation has awarded 90 scholarships with a total value in excess of $500,000. Our mission is to influence qualified Foley, Gulf Shores and Robertsdale High School students’ career paths by providing financial assistance in the pursuit of study in a qualified engineering curriculum. This past week, the 2015 recipients were announced. We would like to congratulate these students, as they have shown excellence in their dedication to the pursuit of their academic aspirations. Vulcan scholars in front row pictured left to right. Vulcan Scholarship Committee in back row pictured left to right. 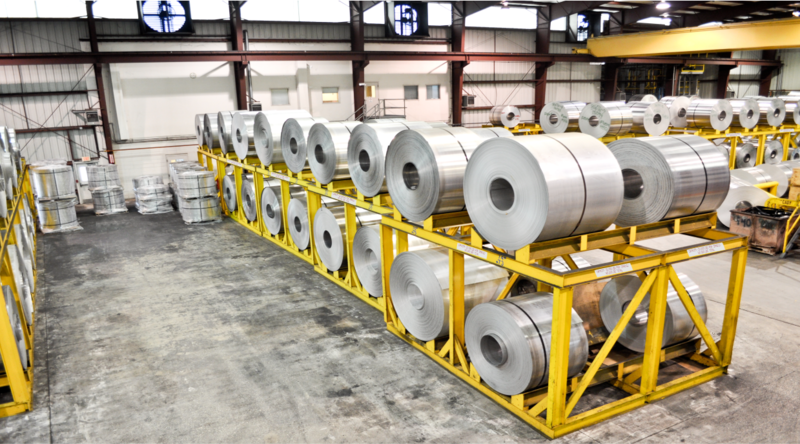 On March 20, 2015, Vulcan Aluminum Mill completed the last major hurdle to becoming ISO certified. This was stage II of a two stage audit process conducted by an internationally recognized registrar. However, the journey actually started almost a year ago. This article is meant to describe the purpose of the ISO system as well as to explain why a company may choose to adopt it. What is ISO? What is a QMS? We’ll start with an explanation of ISO 9001:2008. To put it briefly, “say what you do and do what you say.” ISO is a quality management system (QMS) based on a continuous improvement process with 6 required procedures. Quality has always been a top priority, but we did not have the most efficient method in place for documentation and control. Thus, we began to systematically improve our approach to delivering a quality product efficiently and in a timely manner. In our case, the Mill was able to lean on our sister plant, Vulcan Metal Stampings, to help us transition to ISO9001:2008. 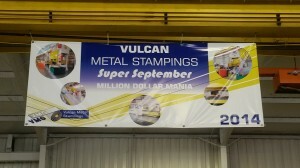 Vulcan Metal Stampings started their ISO journey back in 2003 and was able to share their expertise, which really gave the Mill the momentum and information we needed. Because of this, during 6 total days of auditing, the Mill and multiple staff members were able to show evidence of effectiveness for all 6 of the required procedures. All employees interviewed by our outside auditor were complemented on their professionalism and job knowledge. Why would a company pursue an ISO 9001:2008 certification? The second part of this article is to give an explanation of why it was so important for the Mill to adopt ISO 9001:2008 as our QMS. While there are numerous other recognized QMS’s available in industry today, ISO 9001:2008 is an internationally recognized QMS that opens the door for Vulcan Aluminum Mill to do business directly with a whole new level of businesses, primarily automotive. That is certainly one of the driving forces behind pursuing this certification. Another driving force is the fact that it mandates a controlled approach to improving results in most of the key facets of business. 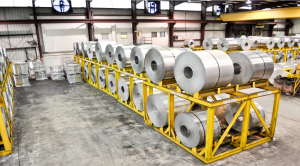 Vulcan Aluminum Mill discusses quality, documentation, customer satisfaction, non-conformances, etc. on a daily basis. Whenever an issue arises that can’t be fixed with a conversation, or when a change to our process or product is required, an action item/corrective action is assigned and monitored until it’s closed. One other benefit is that the QMS helps create and maintain a culture of open dialogue where problems can become opportunities. This is because as each problem is solved, several things are happening, such as, the customer is getting a better product, our operations are becoming more efficient, more profit is generated, lines of communication are paved and surprises become less common. Although a huge accomplishment, completing the ISO 9001:2008 Certification Process isn’t the conclusion to our journey. Rather, it simply set the stage for where we’re going in the years ahead. We all see traffic signs on all roads, which provide all types of information necessary for operating our vehicles safely. 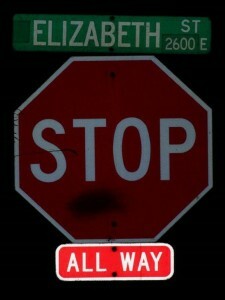 What many drivers do not know is that traffic signs are required to maintain a minimum level of retroreflectivity. What is retroreflectivity? In simplest terms, it is the light that returns to the user from the light source, which in most cases is an automobile’s headlights. Governmental agencies are required to ensure their signs meet or exceed retroreflectivity standards established by the Federal Highway Administration (FHWA). 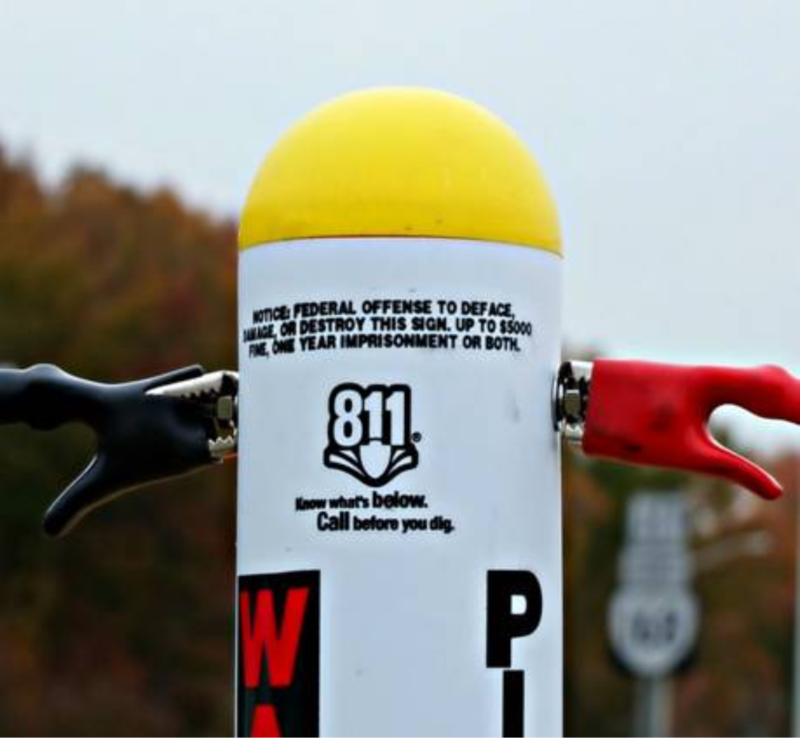 They accomplish this requirement by implementing an assessment or management methodology to ensure traffic signs adhere to uniform standards defined by the FHWA. Visual Nighttime Inspection is performed at night by a trained inspector from a moving vehicle with the headlights on low beam. Measured Sign Retroreflectivity is measured by a retroreflectometer. These devices are typically very expensive and tend to be cost prohibitive for small agencies. Expected Sign Life is measured from the date of installation of the sign by labeling and recording. 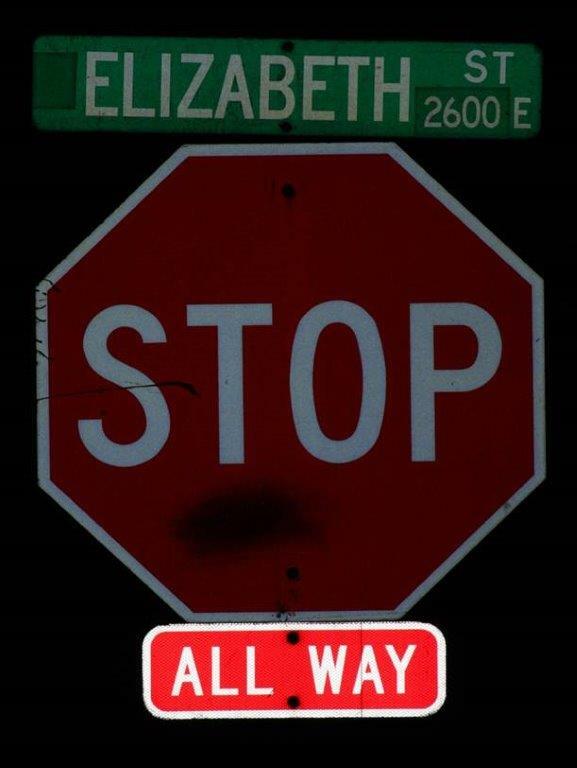 There are many factors that affect a sign’s retroreflectivity like geographical area, the direction the sign is facing and type of reflective sheeting just to name a few. Blanket Replacement is just what the name implies, in that all signs are replaced in a specified area. Some agencies segregate their city or county into sectors, with one sector getting replaced each year. The Control Signs method is a group of signs normally maintained in a maintenance yard. They are erected at the same time signs are installed on the streets, and when they fail to meet the minimum standards, all signs associated with that control group are replaced. 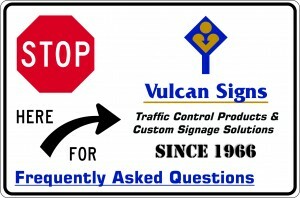 Vulcan began as a small sign manufacturer in Birmingham, Alabama, in 1935 and has continued growing for over 80 years. 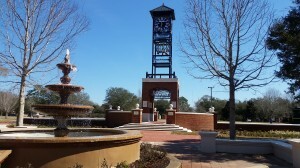 The first production facility was established in Foley, Alabama in 1968. The decision to move to Foley has proven to be the right one. We have an incredibly close working relationship with the city and are very proud of that. The current Mayor of Foley, Mr. John Koniar worked for Vulcan for many years beginning as a Sales and Product Manager and rising to Vice President of Mill Sales at the time of his retirement. He currently serves on our Board of Directors. Proudly bearing the title of An Employee Owned Company, Vulcan has made it a priority to invest in the community in which our employees live and work. 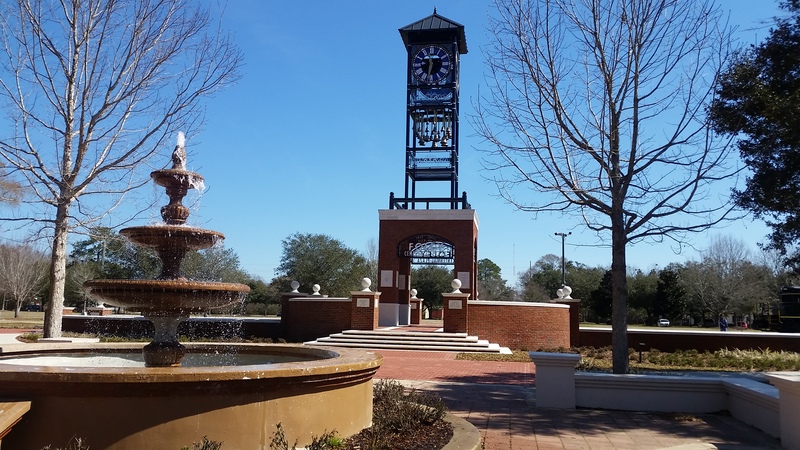 Our active involvement with the area Chamber of Commerce and other organizations such as The United Way of Baldwin County and local schools has strengthened our connection to Foley and its residents. In 1985, Cater Lee, Founder of Vulcan, Inc. initiated the Vulcan Scholarship Program for students beginning their college career in Engineering. Since its inception, Vulcan has awarded over $500,000 in scholarship monies to graduating seniors from Foley, Robertsdale and Gulf Shores High Schools. Our goal is to not only see our business continue to grow, but also to re-invest in the city and local community that we have been blessed to call home for the past 47 years. 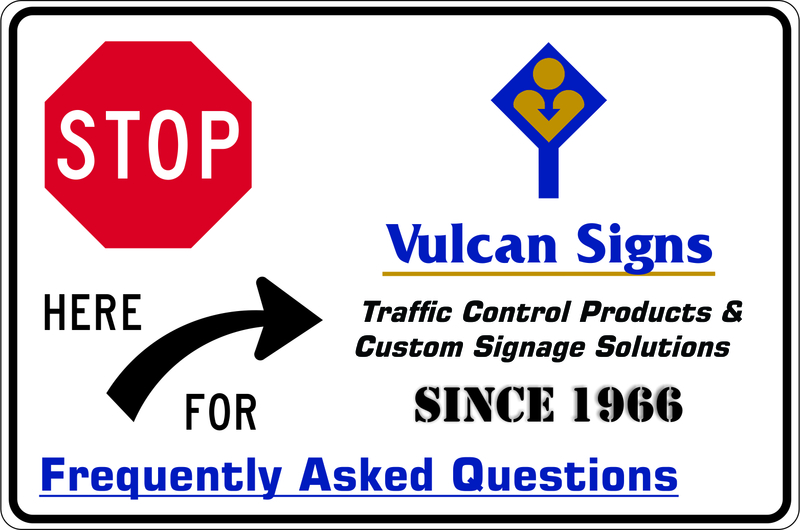 Even though both Vulcan Signs and Vulcan Utility Signs market this product, customers that purchase this item from the two divisions utilize it in very different ways. 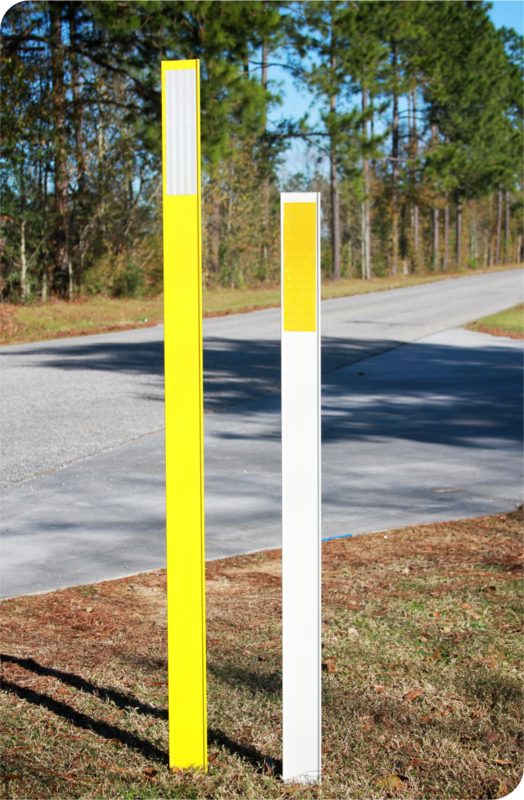 Vulcan Signs’ customers utilize the DRV as a delineator post. The marker is commonly used in areas where traffic merges, as well as sharp curves in the roadway. Typically, a strip of reflective sheeting is applied to the DRV, in order to enhance nighttime visibility. 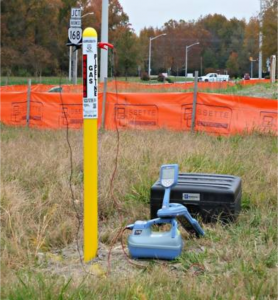 Vulcan Utility Signs markets and sells the DRV as a marking solution for underground pipelines. After WARNING labels with all federally regulated information are screen-printed, one is applied to both sides of the DRV. Vulcan’s unique design helps protect the decals from damage during installation or vehicle impacts, enabling the markers to have a longer field life. DRVs are available in a wide variety of colors, with custom colors available as well. The DRV also has an available anchor kit which is designed to secure the marker in loose, sandy or marsh type conditions. Vulcan’s unique design includes recessed sides which protect the vinyl sheeting from damage during installation or vehicle impacts. Vulcan also manufactures a specialized tool for installation of DRVs. 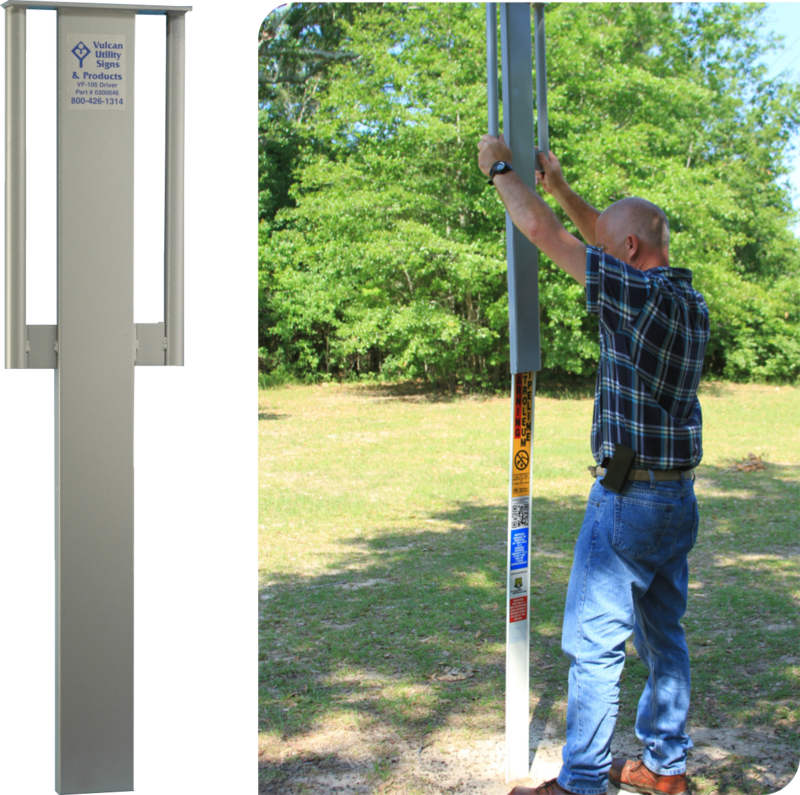 Using the VF-105 Installation Tool, a worker can install a DRV in less than one minute. For more information or to place an order, please call 1.888.846.2728 or send us an email to vulcan@vulcaninc.com.